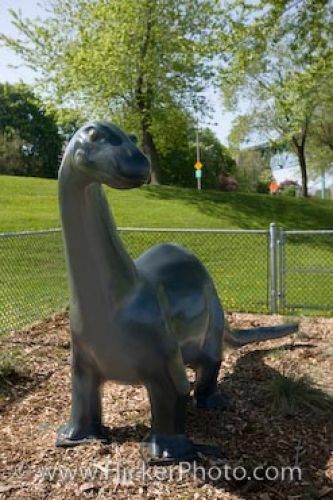 This dinosaur statue on display in the Odette Sculpture Park in Windsor, Ontario is one of two recent prehistoric additions which take visitors back 150 million years. Known as an Apatosaurus or brontosaurus which he was once called, this statue will remain the same size and will not weigh 35 tons like it would have in prehistoric years. The other dinosaur statue in Odette Sculpture Park is the Triceratops, a species which only goes back 65 million years ago. More than 31 large scaled sculptures are on display in the park and visitors to Windsor, Ontario will find this open museum fascinating to tour through. Picture of a dinosaur statue on display in Odette Sculpture Park in Windsor, Ontario in Canada.